Fly Angler's OnLine "Flies Only - 9 - Vince's Fly"
Below is a picture of the fly Vince gave me. Study it most carefully. Several important features are evident. Notice the 'outrigger' tails. For the sub-imago (dun) the split tails keep the fly from rolling or falling over. These are a very necessary part of the whole. Other items of note are: the height, location, and tilt of the two wings, the lack of any abdomen, the placement of the thorax central on the hook shank, and the X winding of the hackle. 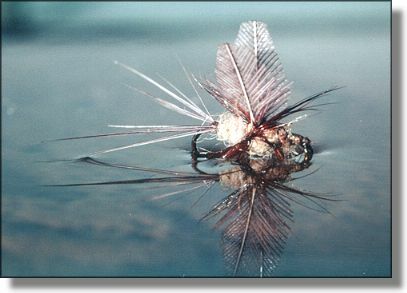 The hackle wound this way does not penetrate the water as conventional hackle does, but allows the fly to ride on the tips of the hackle barbles. In the second picture the fly is seen from above. Notice how the split tails keep the fly upright. 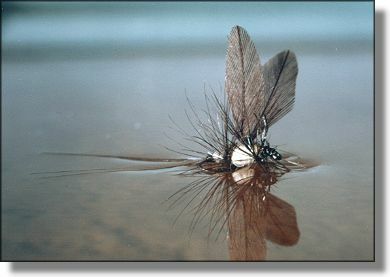 Although the fly was at rest on the surface for several minutes (about 30) it maintains it's posture and the hackle tips remain spread out on the surface. 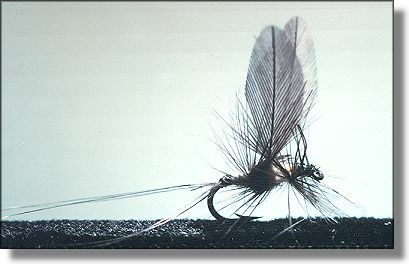 The picture below is a fly I tied as I attempted to follow the directions on his book, A Modern Dry Fly Code. I believe I made a horrid thing of it. I used what I had on hand and it shows. I really messed up the body by making it too long and not getting it in a ball central to the hook shank for the thorax. Nevertheless, it floated. I will say I did not find the instructions crystal clear as to how to tie the fly. Forgive me, it was my first attempt. No excuse, I had his to look at and still botched the job. Old habits are hard to break. This is not an easy fly to learn. Once learned, however, it is very simple.